Representatives of 178 governments from around the world are expected to attend the 16th Meeting of the Conference of the Parties to the Convention on International Trade in Endangered Species of Wild Fauna and Flora (CITES) March 3-14 in Bangkok, Thailand. Proposals to regulate the international trade of five species of sharks and two related manta rays have been submitted and co-sponsored by 37 countries for consideration at the meeting. The proposed shark species — the oceanic whitetip, porbeagle, and three types of hammerhead — are among the most valuable and vulnerable sharks in international trade. 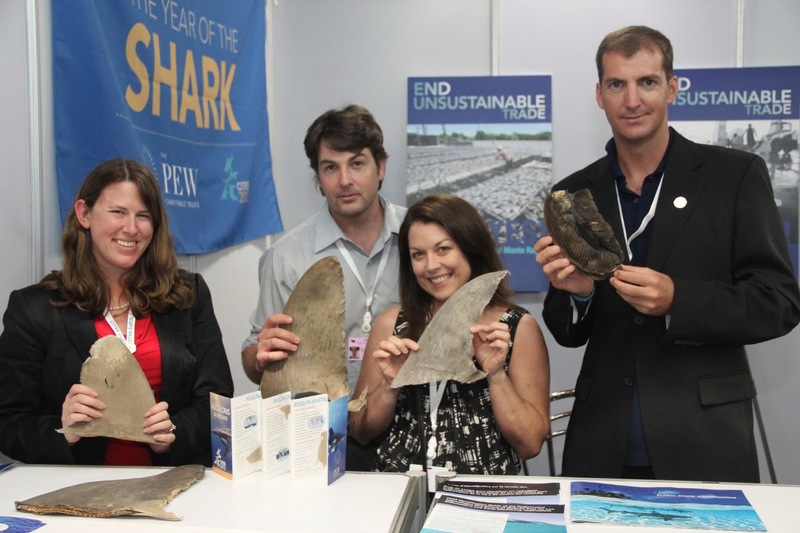 A positive result will limit international trade of shark fin and meat and manta gill rakers and help reduce the threat of overfishing facing these species. 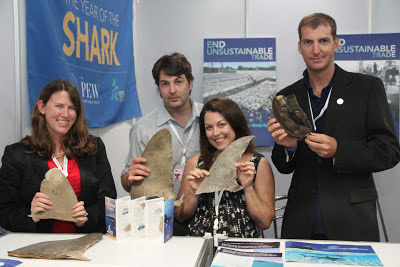 Dr. Demian Chapman of Stony Brook University will attend the CITES meeting to give presentations about a shark fin identification guide he co-developed. Also, as a shark expert and co-author of two recently published scientific papers about sharks, Dr. Chapman will be available to speak with the news media and others as these shark species are being considered for international trade regulation. This guide is intended to help enforcement and customs personnel in the provisional identiﬁcation of the ﬁrst dorsal ﬁns of these ﬁve shark species. In law enforcement situations, this could provide probable cause to hold questionable ﬁns, so that expert opinion could be sought or genetic testing could be conducted to conﬁrm the ﬁeld identiﬁcation. This guide is intended to help enforcement and customs personnel in the provisional identiﬁcation of the ﬁrst dorsal ﬁns of these ﬁve shark species. In law enforcement situations, this could provide probable cause to hold questionable ﬁns, so that expert opinion could be sought or genetic testing could be conducted to conﬁrm the ﬁeld identiﬁcation. This guide is intended to help enforcement and customs personnel in the provisional identiﬁcation of the ﬁrst dorsal ﬁns of these ﬁve shark species. In law enforcement situations, this could provide probable cause to hold questionable ﬁns, so that expert opinion could be sought or genetic testing could be conducted to conﬁrm the ﬁeld identiﬁcation. The shark fin identification guide, developed by Dr. Chapman and marine biologist Debra Abercrombie, is intended to help enforcement and customs personnel in the provisional identification of the first dorsal fins of five shark species of concern. These species — the oceanic whitetip, porbeagle and three species of hammerhead sharks (scalloped, smooth and great) — are globally distributed and large-bodied, and their fins are traded internationally in large numbers. In law enforcement situations, this guide could provide probable cause to hold questionable fins, so that expert opinion could be sought or genetic testing could be conducted to confirm the field identification.